Mrs. Guru doesn’t often make candy finds, but sometimes she does, and this is one of them. How’s that for a super descriptive intro? Pretty unique bag, it certainly looked original to me. 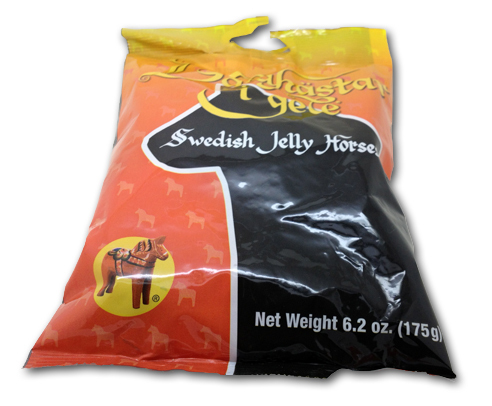 I don’t have a lot of experience with Swedish candy, so I’m all ears when someone presents something new. What to expect when something is described as a “Jelly Horse”, though? Whoah. I LOVE the look and colors of these. They’re little horsies! And they look delicious. You can even line them up like the equine centipede if you so desire! But before I can get to any taste breakdown, we have to discuss something else: the smell. Usually, when opening a bag of sugar based chewy goodness, you get the standard sugar sweet smell. Perhaps there’s some fruity notes, or super strong natural scents coming through, but mainly it’s a fruity collage for the nostrils. These candies were very different, as I was bowled over by the strength of the…maple smell coming from the bag. On first smell, it was absolutely disgusting. But then I had to think about it: why the hell would maple syrup be gross? After the concept settled in, I realized it was simply because maple and fruit gummies are just two things that would never go to together in my universe. On it’s own (or on pancakes, waffles, fried chicken, pork belly, bacon) maple sugar is a delight-but not with a fruit based gummy. It just didn’t and doesn’t work for me. But that’s where this story gets even odder. They don’t taste like maple. And (cue cliche 80’s horror movie stock footage) THERE’S NO MAPLE IN THE INGREDIENTS! THE CALL IS COMING FROM INSIDE THE HOUSE! What the hell? In fact, upon a second run through of the ingredients, there was nothing even close to maple. Finally, to cap things off, the second bag I opened (I like bulk purchases, yo) had almost no trace smells of maple. However, it was still there, just on a much lighter level. The good news is that these things taste great. Sort of hard to pinpoint flavors, but very good nonetheless. But the real star here is the consistency. Wow. These bad boys are hard and tough on the outside, and JUST a bit juicier and softer inside. 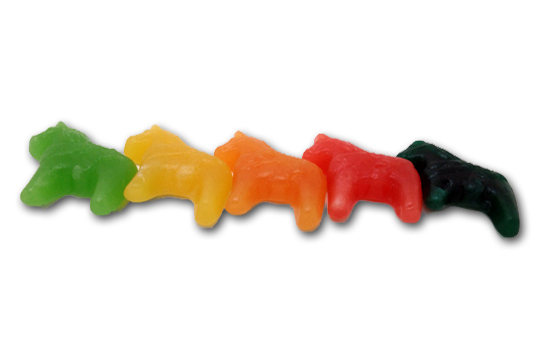 They make for an outstanding chew- that was unanimous among all who tried them. In fact, so was liking them, even in the weirdo maple bag. In my book, that makes these a winner. 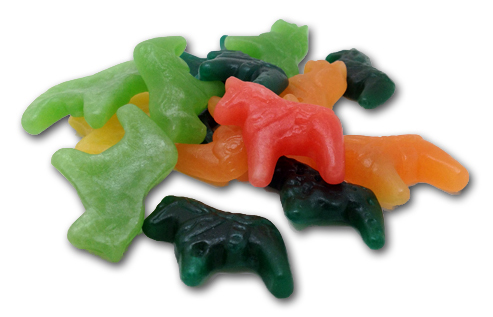 My final theory is that the dark green horses have some unique flavoring that smells like maple but isn’t, as they have a bit of the maple taste in them. Case closed. This dude was sitting in my home office, just feet away from me. 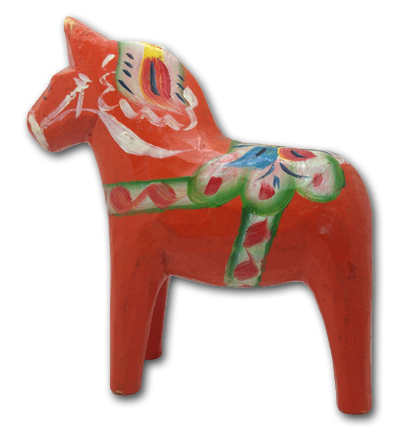 This little “Dala Horse”, an iconic Swedish figure, has been in my small family as long as I remember. In fact, when I lived with Matty a million years ago on Irving & 12th Avenue in San Francisco, I had already lugged this guy to and from college, and then to a few different places to live. One day, when I opened my 2nd story window in my room, he fell out onto the street. Thus his lack of a tail. I actually forgot to go get him for ten minutes, and then freaked out and…there he still was, sitting there waiting for me on the street. I told all of this to Jonny Guru Jr. as we were taking the photos, and now I’ve given “‘No Tail” to him, for him to keep. I’m not sure why this feels significant to me, perhaps it’s because we have a small family and not a lot of things that have been passed down. Yet, a Swedish Dala wood horse? My family is Russian, Polish, and a scoshe of French (my name only). I couldn’t be LESS Swedish, save for my enviable swimmers physique. Yep. Thanks, candy! Not only did you turn out to be delicious, but you made it about family for me, which is very cool. Pick up a few bags of these at World Market if you have one nearby. There’s nothing candy can’t do. And somehow my whole life I thought that horse was Mexican. That’s a wonderful story written beautifully. Kudos! Actually, I’m near positive it’s Mexican! 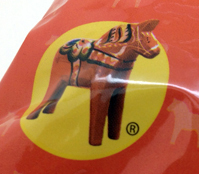 you might have bought it in Mexico, but it’s supposed to be a Dala Horse, which is Swedish. Mexican Swedes-my fave.